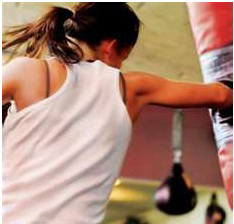 Our kickboxing classes begins with a five- to 10-minute warm-up that involves large muscle movements to increase blood flow and heat up the muscles. 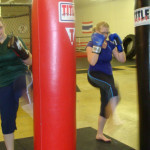 The main portion of the class involves combinations of punches and kicks that are repeated multiple times to ensure mastery. Class concludes with a three- to five-minute cool-down that involves static stretching of the hips, shoulders, and core.